It was a friends birthday recently and I wanted to make a cake. I had all sorts of possible ideas but I wanted to make something different rather than the ones that I was used to making over and over. Lemon and elderflower work well combined in a cake and has been pretty popular since the royal wedding. I made sure my friend like the latter flavour as I know she lovely lemon cake I got hold of all the ingredients so I could start baking. Grease a 9 inch baking tin with butter. Place the milk and butter in a pan and warm gently until the butter melts and then remove from the heat to cool a little. Whilst the butter is melting measure out the sugar and add to a mixing bowl, add in the eggs and vanilla essence and whisk with an electric mixer. This is ready when it has doubled in size and is much paler. Pour in the milk and butter mix to the egg mix. Add in the lemon zest and elderflower cordial. In a separate bowl measure the flour and add the baking powder and combine well. Sift the flour into the mix and gently stir this in. Pour into the baking tin and place in the oven. Cook for 8-10 minutes until the top becomes golden then lower the heat to 180 and cover with foil and cook for a further 25-30 minutes. To check if the cake is cooked insert a metal skewer and push to the bottom. If this come out clean your cake is ready. If wet batter has stuck to it then place the cake back in the oven and cook a little longer repeating the checking process. Once cooked and cooled, halve the cake and cover with butter cream. 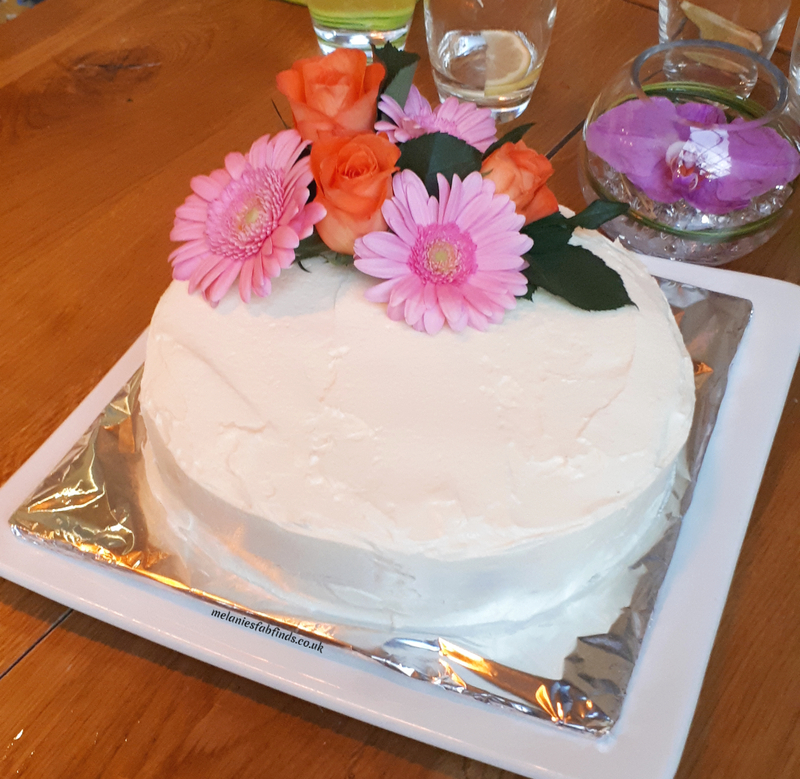 Flowers make a cake look beautiful. Make sure you cover the stems with florists tape and avoid any toxic flowers. Pineapple Upside Down Cake #WackyBakers & a Num Noms Freezie Pop Giveaway! My FIRST EVER two tier cake – Yes it has a Frozen Theme! This Butter Cream Cake looks very tasty. I would love to try my hands on the recipe. Decorating a cake with flowers is a great idea! I used to do a lot of baking and the common theme was they tasted great but my icing skills are…erm…questionable! The flavour of this sounds amazing too! The flowers do add to the appearance although even without it’s a great cake as it tastes really good. I love lemon cake, its my favourite. This looks lovely and really easy to make! It’s super easy. Anyone can do it! Ohhh my gosh do you know Buttercream is one of my favs I tend not to do much baking as I end up eating all the buttercream lol, would give this one ago as sounds and looks very nice. Ha, that’s true. It was lovely although different from the Royal cake that was made. When I used to be a kid my mother would make elderflower lemon juice using the plants me and my sister used to gather from the woods nearby. It was so good! I can imagine that your cake has the same delicious and refreshing flavour! Elderflower works really well with the lemon. I love baking a good cake every now and then, and this looks divine. Shall give it a try! Butter cream icing is delicious, we love it too. It tastes great. I really did love this cake. Such a simple cake but amazing flavours indeed, would love to give this cake a try when I am free. Gosh, lemon and elderflower sounds absolutely delicious and it looks so pretty too! Yum, beautiful cake I would love to make this cake. My husband would love it. It’s really lovely. I’m so glad I made this. I love lemon cake and would love to try with elderflower too! The flavours work very well. It really is. I do love elderflower. Thanks so much Jeanette. I did have fun making it. It was really yummy too!! !